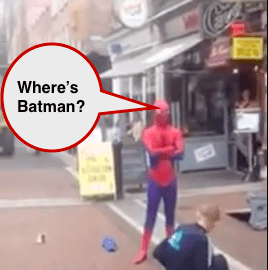 This video from Grafton street shows Spiderman after he was robbed. Determined to see justice prevail, and even though he was much smaller, Spiderman uses his powers to ensure the suspect does not escape. According to the notes a street performer dressed as Spiderman was robbed. But rather than let it go he immediately jumped into action. While his colleague (off-camera so we don’t know if she was a civilian or Wonder Woman) went to get the Guards, Spiderman went about making sure the suspect didn’t escape. The result is a somewhat surreal, if sad, video.